A week ago Saturday I was leading advanced teacher training sessions in Salvador, Brazil, at the invitation of the excellent statewide social action through music initiative Neojiba. The city is beautifully situated, perched high upon on the cliffs at the confluence of the waters of the Bay of All Saints and the South Atlantic. Here make landfall the last breaths of the trade winds that a century earlier made this coast the first point of call for sailing vessels bound for the Cape of Good Hope or Cape Horn. The Salvador of today is very different from the colonial port of the late 1800s. Home to some three million people, it is now the third most populous city in the nation. The explosive human and economic growth, unaffected by the economic downturn in the northern hemisphere, has exacerbated and magnified all the problems concomitant with urbanization and development; Eduardo Torres, Pedagogical Coordinator for Neojiba, tells me that Salvador is also the state capital with the highest percentage of “miserable people” in Brazil. “Those without sufficient money to buy enough food for one day,” he responds. It was a grim reminder of the magnitude of the challenge facing not just Neojiba, but any Sistema-inspired initiative in the world. Regardless of the copious rhetoric about “changing lives,” not much can be done when there are people going hungry; no amount of spiritual wealth can compensate a child with an empty stomach. 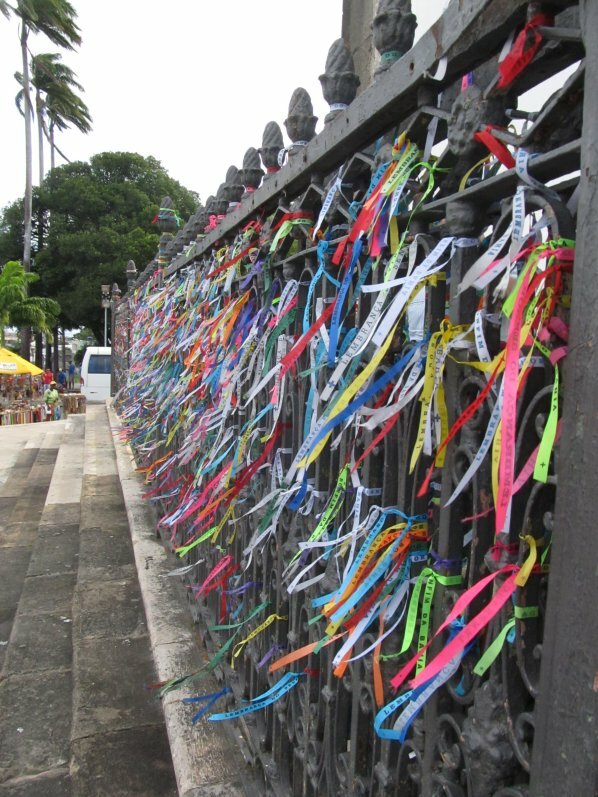 Prayer ribbons outside Igreja de Nosso Senhor do Bonfim. And when the question “why it might” is paired with the issues of hunger, the answer is at least superficially straightforward: feed them, or work with someone else who can. Many of the programs in the United States have already taken this step and are providing snacks to participants, under the reasonable assumption that a hungry child will have a very hard time concentrating on anything else except his or her stomach. But there’s a deeper issue here as well: problems of poverty, class conflict, educational or ethnic inequality, be they in the north or south Americas or anywhere else in the world, are by their very nature extremely complex in both cause and manifestation, and are deeply embedded within society. Initiatives like the Harlem Children’s Zone take the position that approaches to systemic social issues must in turn be systemic and comprehensive, involving multiple stakeholders, agencies and institutions with a multi-decade outlook. Accessible music education will be an integral, essential part of that solution, but ultimately, it will only be a part. I don’t doubt the ability of any organization acting in isolation to have some impact tomorrow: I doubt its ability to cause major social shifts in ten, twenty, or even thirty years time. Far from being a criticism of the Fundabol, that statement is in fact a defense. Those naysayers who point to the perceived lack of social change in Venezuela over nearly forty years of the Fundación’s operation are being extremely selective in their choice of facts. The staggering expansion of the Fundación is a relatively recent development, and is a product of long-term, patient advocacy and trust-building within the nation. Given the sheer immensity of the social problems the nation faces, notwithstanding discussions of causes, the Fundación’s current activity and scope should in itself be viewed as a remarkable achievement. Even if its membership now exceeds half a million, that is still barely two percent of the population of a burgeoning nation, and we have no data or history as to what constitutes a critical mass for seismic social transformation – Venezuela will be the first to tell us. The Fundación has changed a nation’s attitude to music: now begins the work of changing attitudes towards society. As for the rest of the world, in the spirit of “why it might,” I refer again to the Fifth Fundamental, that of connectivity. We as music educators have to have the humility to accept what we can and cannot do – and above all, not to promise more than the former in our passion and exuberance (or to borrow Marshall’s term, hysteria) lest we damage irreparably that most fragile of entities, public trust. What we can do we should, unequivocally, and that is music, but the greater lesson is for once quite simple. Collaborate – connect – or fail. I took no offense and no apology is necessary – frankly, it was flattering to infer (even if I did so erroneously) that I was placed in roughly the same category as Leon Botstein. I understood what you intended by naysayer, but if applied to me then there would be no term for people like Igor Toronyi-Lalic, one who most definitely says nay. I would prefer “pragmatist” (in the sense of James or Dewey) or “realist” were I able to choose: one who thinks the copious amount of poetry and uninformed rhetoric may ultimately do more harm than good. I’m afraid I’m not for changing it back! Naysayer was there when I had first put something in about Tornoyi-Lalic, but I decided it wasn’t worth giving him the air time. And I also don’t think Botstein is a naysayer, but instead, also a sceptic-pragmatist. So, you’re still in his club as fas as I am concerned. With the greatest personal respect I have for both you Jonathan and Marshall – I think the biggest single obstacle facing the development of Sistema-based programs and organisations around the world, is not collaboration or connection, or dilution, or even the lack of a rigid adherence to the principles of El Sistema, or public trust – as important as all of these are… It’s MONEY. All the planning, determination, passion, style, panache, charisma and desires of fulfilment in the world, come to nothing if it is not backed by considerable funding. This has to be realised either through substantial government handouts “grants”, systemic funding (government legislating the programs), ongoing philanthropic funding, organisational support and adoption (ie. through major music organisations adopting programs), corporate sponsorship or windfall. With any of the above, it has to be SUSTAINABLE funding – ie. going on ad infinitum so that the programs don’t halt. The naysayers are not the individuals incorporated in the “movement” (and I use that term advisedly), but the doubters in the music and education fortresses who for some reason feel threatened by the idea of such an amazingly good idea for music and education and society. I gave a presentation on Sistema-based program development in Australia at a community music forum in Australia recently. Well attended by a large number of community-based music organisations, there was considerable interest and support for the development of Sistema-type programs and it was greeted with great enthusiasm, until the cost of such programs was raised. One of the group stood up and suggested I was dreaming if I thought I would get Government support for such a program… About 15 minutes later the same person proudly revealed a multi-million dollar annual sponsorship of his music conservatory, by a substantial Australian company. This fed a relatively small program in one small city and one youth orchestra. I calculated that such a sponsorship would provide for 20 orchestras nationally for 1,200 children, in Sistema pilot programs in Australia based on the model we have trialled successfully here for over 15 months. This makes me think that in this country at least, sustainability is reliant on strategic sponsorships, probably both with the private and public sectors. And this is where our program will target its success. Therefore the big debate for us, at least, is money and sustainability. We have most of the other bases covered. You illustrate the very issue to which I was alluding. Music education of the nature we propose, by virtue of its extremely high per-capita costs, will inevitably be a lower funding priority for any agency when issues like child hunger remain prevalent, more cost-efficient and more popular to address, even if focusing on purely material needs is as incomplete a solution as solely focusing on developmental needs. To a certain extent I agree with you – a consortia approach seems like a really good approach – everyone bringing something to the table. But… and it’s a big but (yes). But I think that it’s useless trying to frame co-operation and collaboration without a really significant financial backing lure to establish the collaboration in the first place. I’ll take that further: I think that our quest as Sistema advocates is to convince the potential supporters – both public and private – of the inestimable value of preventative intervention through orchestras and music – for all of our society – for all children. This potential energy (money) which has the power of a thousand suns to fuel our programs requires a significant amount of heat to convert it into kinetic energy – motion, activity and dynamism. It comes usually from just one person. So much depends on this one person for any of these projects to actually get up and work – for collaborations to even be conceived – and the promise of money. If you look at the successful programs around the world, they are typified by one person doing it – providing the vision, and a degree of blood sweat and tears to make things happen, often personal funds, to provide more than simply a catalyst, but the very energy of the program itself. Principally, folks like Jose Antonio Abreu (VZ), Richard Holloway (Scotland), Anne Fitzpatrick (NYC), Dan Trahey(Baltimore), Julian Lloyd Webber (UK), Dantes Rameau (AMP), Gustavo Dudamel (LA), Joe Harrop (NZ), Don Matheson (New Brunswick), and Ricardo Castro (Brazil) to name but a few – heroes of the El Sistema revolution. Without these people and the energy they generate it simply wouldn’t exist regardless of collaboration. And almost entirely under their own bat, they have winkled out funding from underneath rocks, sponsors, supporters, unpublished government funding, chance encounters on stairwells and in lifts, and despite everything being somewhat improbable and appallingly difficult. So let me add to my premise above: it’s about sustainability through substantial ongoing, sustainable funding and through the unreasonable dynamism of the founder. These are the critical aspects of a Sistema program ANYWHERE in the world. And all of this against a tide of indifference, lack of the grasp of the significance of the programs, a deep misunderstanding of the programs themselves, and a high degree of skepticism in the applicability of the program to non-Venezuelan communities around the globe. If you can hear tired frustration in my “voice”, you are right. I often feel am wholly inadequate and unworthy to generate the energy here in Australia and there is such a toll and demand placed on my enthusiasm, time, passion and money to fuel the fires of such a revolution. I am moving frantically away from altruism and wholeheartedly towards dragging support from underneath rocks and hard to get to places – those are the places that no one else involved in Children’s music has been able to reach, and therefore are generally untapped. They are in themselves another Everest of gigantic proportions. I think that nothing at all, collaboratively or not, can happen without that real material support – and lots of it. Find the source of funds and the collaboration partners will be tripping over themselves to join up! I agree with you – I might go so far as to say you further illustrate my point. What has been accomplished by individuals such as yourself, as impressive as it is, is clearly not sustainable. What happens to all these programs when the individuals who have built them from the ground up exhaust their energy or personal resources? Whether it’s a government or corporation writing the cheque, the signer is going to be concerned about the return on investment. The equation with which they ultimately evaluate any proposal is simple: what does the project cost, and how likely is it to succeed? Politicians have very low risk tolerance, and corporations (except blue chip financial institutions when they think they can make trillions) aren’t far behind. A consortium is like an index fund on the stock market: it spreads the risk over the entire listing, as opposed to the alternate approach of betting the farm on a startup. From the perspective of the “uninitiated”, Sistema is high risk: it’s very expensive, with the perception (erroneous as it is) of uncertainty of return. This is why programs everywhere are struggling with fundraising. Ohh I so agree with your response. We need a magic bullet, and we cannot rely on Venezuela to be that – we have to be able to create sustainability all by ourselves. Regarding risk return specifically – this is the case for all “preventative” programs. We live in a world that demands proof and substantiation before it will lend its support. By far the most significant government and corporate money allocated to social ills and the community, is directed to dire straits – social catastrophe, disease, the fallen, the disabled. Not that money shouldn’t go to that – and more please. But if we could draw a big thick red line between what we are doing and the lowering of the occurrence of some of that (not everything obviously), we would have substantial funding for such programs. I suspect it’s lobbying and marketing/promotion we need more than anything. So that our programs are seen as substantive and valuable. But for that… you need money. Love this conversation, “In Search of Silver Bullets”. Selling societal gain to society should be easy, but it’s a very crowded market place. Even if we had solid historical outcome data, it just gets us in the government suppoort battle, but not winning it. Any fighting strategy includes utilization of allies, which Jonathan emphasizes so well. Whatever our percentage of contribution to society’s problems, Sistema is part of a larger force. Association with global corporate sponsors, especially high profile consumer brands, is my best shot at a sustainable silver bullet. As a Reagan capitalist I still believe in trickle down in this sense: Imagine the impact of a Super Bowl ad with Fedex and Sistema. Immediate brand recognition by every funder in the world, including other corporations like Nestle who might also see association with us a great CSR alliance…. then One World Airlines, then Marriot, then Hyundai or Samsung. What makes these relationships sustainable is the value we deliver to them, not the reverse. Believing we have more to offer them than they do us is key, Ronald McDonald House gave more to any local franchise, than any McDonalds restaurant ever gave to Ronald McDonald House. They will never drop that strategy, it is now part of their culture and inextricable. Sistema distaste for an overarching global association keeps us out of this enterprise. Players like the Aids Foundation are offering global corporations a shared value proposition which we cannot. This costs our global movement millions, maybe billions. US doesnt want to lead a global effort, and Venezuela can’t. In my view a truly international board of an independant “Global Friends of Sistema” is the best and fastest route to this end. Not lead by internal stakeholders, but for them. Sistema Japan has this kind of vision on a national level. This is where capitalists can take their place in Sistema. Venezuela, Canada, UK and others see through the filter of a more socialist society, and it works for them. Give old fashioned value-sharing free enterprise a chance, and watch out for flying bullets.